Now that all of your food is made, it's time to set the stage for your Cinco de Mayo fiesta! Gather your brightly colored decor and get busy....the brighter the better. I got a few fun things to add to my table this year. For me, the whole idea is to make your table look cheerful and happy. You'll notice I used the same "celebrate" sign and sombreros from last year but I added the 3 little burro pinatas (Hobby Lobby) and the pom pom napkin ties (Walmart fabric section). I know...Walmart? They have crazy deals on all of their fabric. I also used the same green tablecloth that I used here and here. The floral fabric square is a remnant I got at Walmart too. The little bubblegum coins are from the Mexican food aisle at my grocery store. I just sprinkled them around the table to add color. I used the same circle garland around the table. One of my little burro pinatas. Everyone gets a basket of treats. Chic -o-Sticks, Chiclets and bubblegum coins. This year I added something new. It is the year of the mustache. I bought these at the party store. They are adhesive and came in a pkg of 6. These mustaches are way more fun than I thought they'd be...you'll see why soon enough but first, lets move on to drinks. I like to dedicate most of my time on appetizers and the main dish, therefore, I usually buy my beverages and spritz them up with fresh fruit or cinnamon sticks. 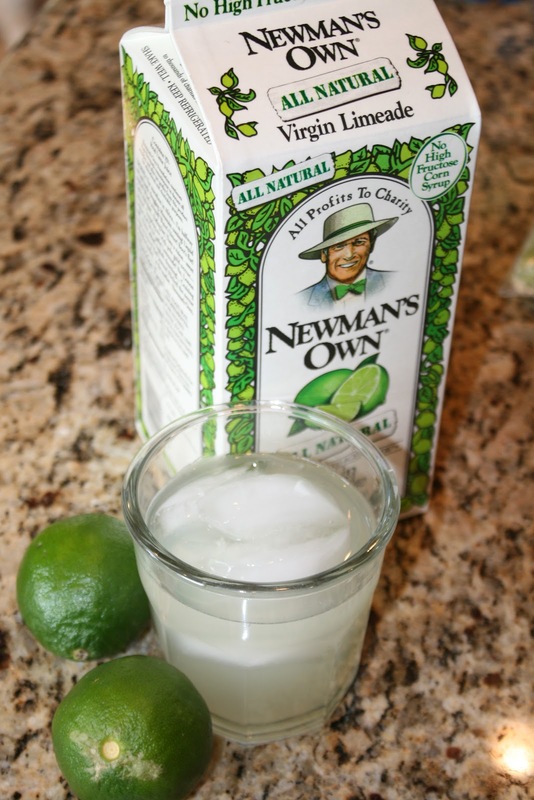 For Cinco de Mayo, I love to serve limeade (Newman's is the best). Horchata. I love this drink. 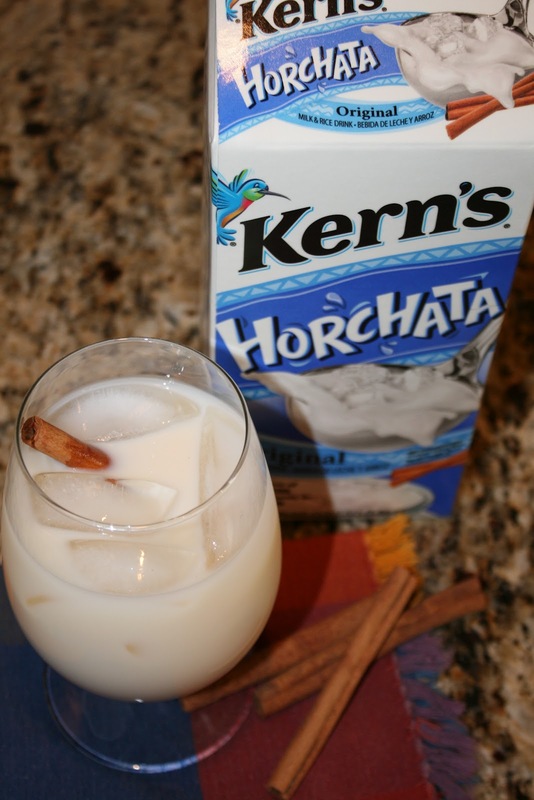 Basically rice milk with a hint of cinnamon. Delicioso. For a Margarita (we do virgin Margaritas here) you need about 4 oz. 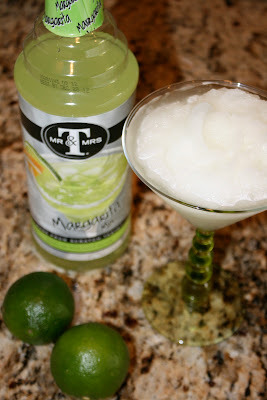 of Mr. & Mrs. T's margarita mix. Add ice and blend well. 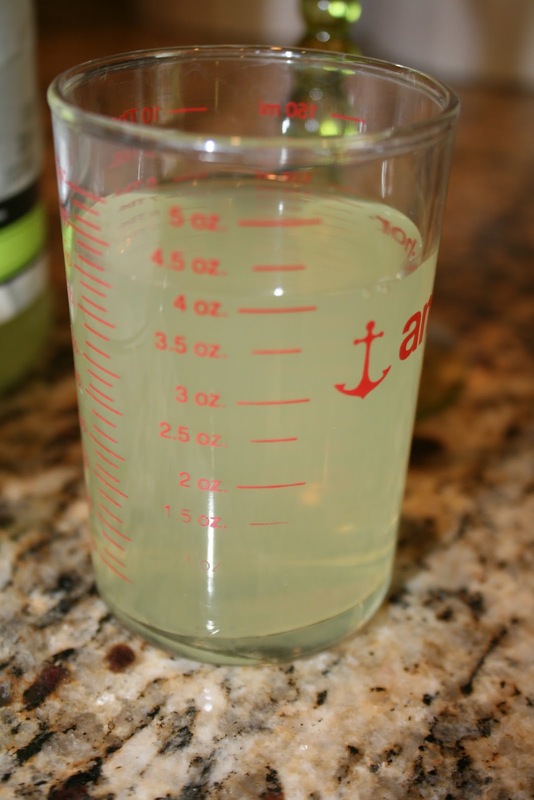 Don't forget to serve it in a salt-rimmed margarita glass. Oh! That'll make you pucker. Everyone put on their mustaches before dinner. Then it got a little crazy. Mr. Newman got a 'stache. So did my burro friend. The candle got one too. What fun we had celebrating Cinco de Mayo. Now who's going to help with the dishes! 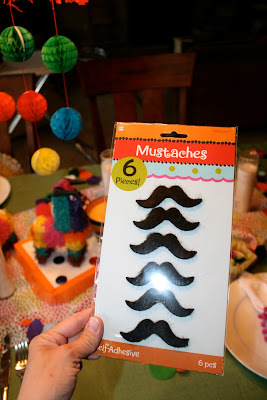 1 Response to "Cinco de Mayo Drinks and Decor"
Did you wait on your waxing so you didn't need a fake mustache? Boosch! Fun stuff senorita. I bought the mustaches too.